The idea here is to show a concrete exemple for implementing a Neo4J server (embeeded) that will represent a Twitter Stream Activity. I create a very simple class to handle the network logic and the initialization of the Neo4J embeeded server. I need to use index to retrive existing nodes. So, I have a master index twitterEntities and several others that might be useful one day (I’m not advenced in Neo4J to know what to do with that). Now it’s complete, I plug it into my TwitterStreamer when it receives a Status. And that’s it ! Just have to run it and wait for t(w)itts ! I create a special style to have a nice visualuzation of my entities. That’s very easy and helps a lot . The webconsole ist zuper toll (as we say here) ! It’s a kind of real-time and you can be more precise on your research. I don’t master yet the query language, but it seems to very powerfull for complex query. 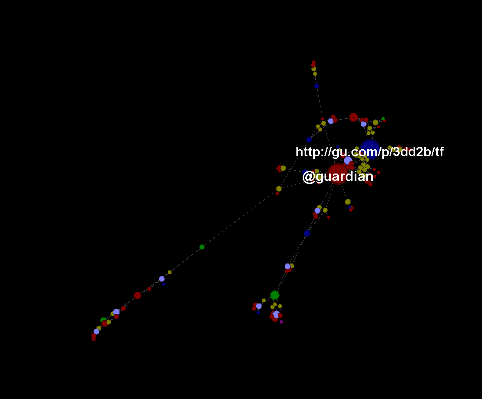 (there is a plugin in gephi ! but it’s buging on my side ….). I’m also eager to try Linkurious, maybe this tools will bring more usabilly for playing with graph than the standard webconsole. Cet article a été posté dans Data Visualisation et marqué comme graph, neo4j, twitter par Matthieu Totet . Enregistrer le permalien.